The Mueller Report has been leaked to AP. It reveals that Donald Trump stinks! Barack Obama was not a Socialist. Not even a socialist. Not perceived as one either- not by Ds, Us or anyone serious. I mean more like Sanders, Jerry Brown, or Elizabeth Warren. This is what leadership looks like. After 50 people are gunned down at worship by a hate-filled man with assault rifles, New Zealand prime minister implements ban on military weapons for civilans. Not just "thoughts and prayers". Not just being "shocked and sad". Not just "We'll fund mental health services……someday." 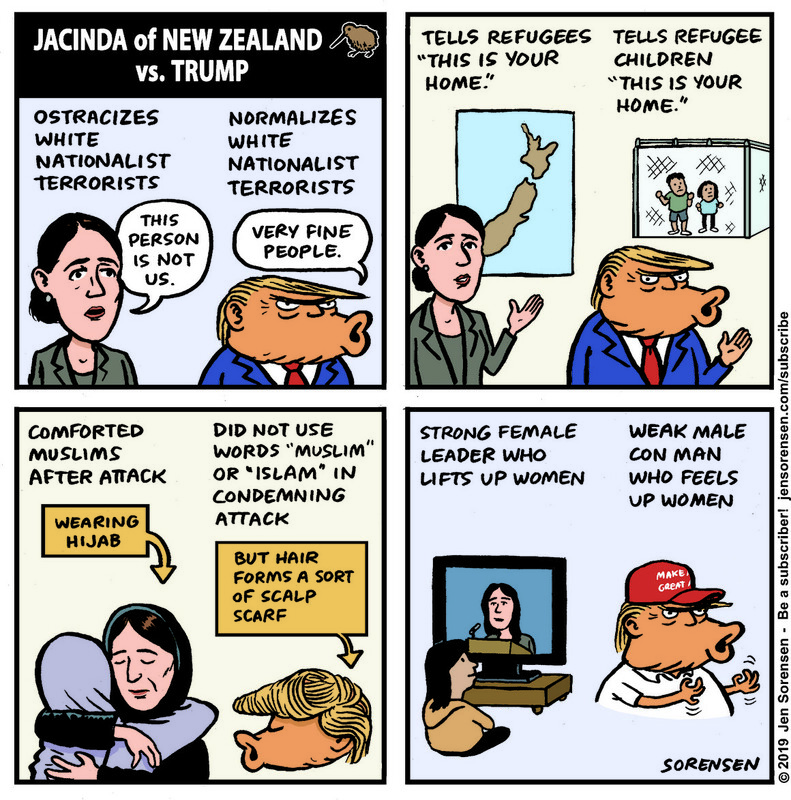 That's all appropriate, but New Zealand prime minister Jacinda Ardern is starting with getting the assault guns under control. New Zealand will go the way of fellow down-under state Australia, which banned assault rifles in 1996. You have to have a license to possess a firearm in Australia – update it yearly, prove why you want/need a gun, pass mental health screenings. Annd….no mass shootings since 1996. It's what we need to do in the US. What's it say in NZ? Something more effective than Hopes and Prayers, that's for damned sure. And they don't have to worry about brave Militiamen around their first-graders. I had more to say, but it wasn't helpful. Sometimes Curmy, words really do fail. La Pierre and his whole rotten bunch. They'll watch the world burn as long as they can do it from a penthouse or a yacht. They don't care about the penthouse or the yacht. Their only concern is that their situation is measurably better than others'. You got 2 bedrooms and a bathroom? They got 3/2. Last day of the (45th) annual Denver March Powwow (Denver Coliseum) . . .
. . . if you ain’t there, or never have been, you should be. QOTWE: Why, whenever Alva/Wordpress jacks up this site, and someone points it out, is there always some helpful soul(s) suggesting that the problem is you and/or your browser?
. . . I guess it must be a law, or maybe in the Colorado constitution, or something?? Have you tried switching to a different browser? Maybe Safari? I was teasing Dio. But, glad to know it works! My operating system this weekend, as we approach Day 800 of America’s being held for ransom, is Super Lemon Diesel and Bacardi Ron 8 Anõs (. . . btw, that’s “ōchō”, not “āte, gabachos . . .) . . .